After much debate (with myself) I decided on my next big project. 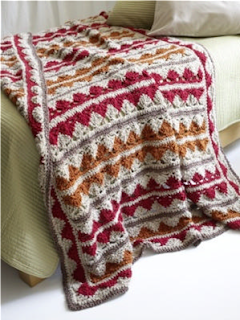 I wanted to make Chris an afghan and searched for a long time for the perfect pattern. This is the Seashore Afghan pattern that I chose different colors for and have since dubbed it The Night Sky. This has reminded me of something I learned long ago when choosing color schemes, look to nature for ideas. The Seashore Afghan is beautiful, representing the water, the sand, and crashing white waves but it is a bit too feminine for my hubby (in my opinion) so I hunted for the perfect yarn/colors to create one using dark gray, medium gray, burgundy, and off-white. I found the perfect yarn but had to compromise on the colors and chose these instead. As I worked the first row of gray I thought it blended in too much (this is the tan row in the seashore pattern and I like how that pops) and planned on changing it to burgundy but Chris likes it and that's what counts! It's probably better this way, adding a red may have made it look to much like a flag. And I should add, my yarn shopping was RIGHT in the middle of that recent snow storm. I had to go to Mill Creek to return some yarn. I was 5 minutes south of Mill Creek, driving on wet roads with dry skies when things suddenly changed for the worse. Long story short, heavy traffic on side roads + freak snow storm = slow going. It took me an hour and a half to get home when it only should have taken 20 minutes! I had both boys with me, every detour I could think of was blocked due to road conditions, and I was wearing sandals with no socks. Lesson learned! This yarn is like butter in your hands. It looks and feels like the softest cotton EVER but it is 100% synthetic (ironic since Chris was hoping for a natural fiber....I couldn't bring myself to pay those prices though)! 50% Super Fine Nylon and 50% Super Fine Acrylic. It's Berrocco "Comfort" worsted weight yarn. It is washable, dryable, and under $6 a skein! I had help choosing yarn from the fabulous customer service at a local yarn shop called Village Yarn & Tea. I am excited to get it done and will probably neglect other crochet projects that might earn money in the meantime:) I am a little OCD in that way. I have earned about $80 so far! Not bad, huh? All of it has been from friends, none from Etsy, and I have a long list of ideas to work on soon. Here is the other afghan that I fell in love with but it is made with Lion Brand Homespun yarn and I was warned that it might snag too easily in a household with three children so I will save it for another day or for another person:) It is the Zig Zag Afghan (not to be confused with the "chevron" zig-zags in the Seashore pattern).